In the first quarter of 2016, Japan’s real GDP grew -0.05% (year-on-year), slowing down from 0.85% in the previous quarter. This is the first time since 2013 for Japan’s economy to grow negatively, excluding the four quarters after the consumption tax hike. The Form 13F for the first quarter of 2016 has been published, and the portfolios of hedge fund managers revealed. In the disclosure, Mr George Soros’s Soros Fund Management appeared to have started positions in gold and a gold miner and also to have continued short selling of US stocks as he claimed in Davos in January 2016. The GDP data of the US economy for the first quarter of 2016 is published, and the real GDP growth turned out to be 1.95% (year-on-year), slightly slowing down from 1.98% in the previous quarter. 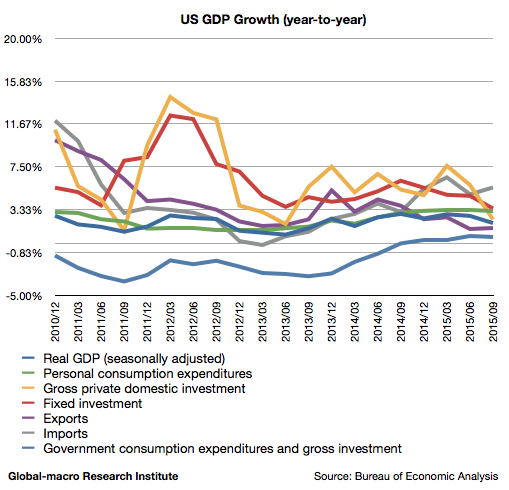 As the economic growth in mid 2015 was greater than 2%, the figure indicates the economy has decelerated after the Fed ceased quantitative easing. Japan’s GDP data for the 4th quarter of 2015 was published, revealing that the real GDP grew 0.66% (year-on-year), slowing down from 1.65% for the previous quarter. 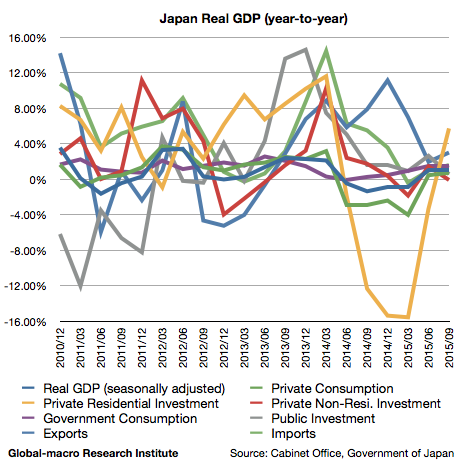 The chart obviously shows the consumption tax hike in Apr, 2014 ruined the uptrend after Abenomics. 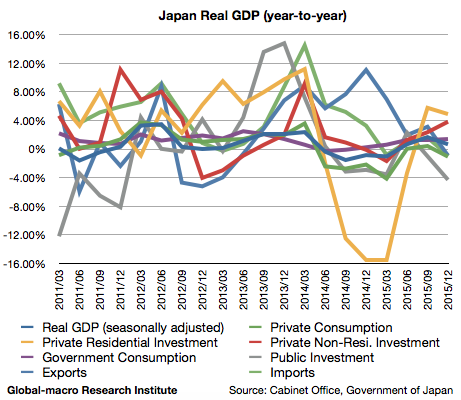 We will review the elements of the GDP, which indicate more about what is actually happening in the Japanese economy. 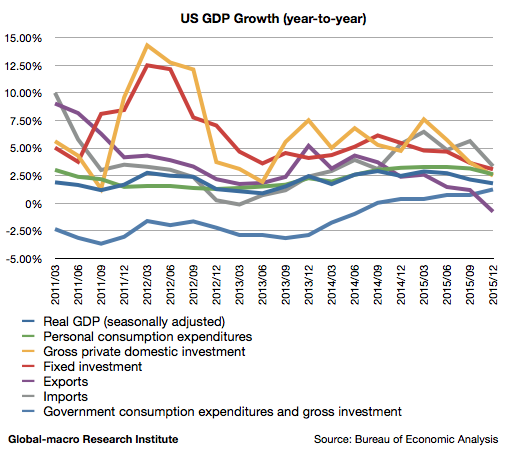 The US economy only grew 1.80% (year-on-year) in the 4th quarter of 2015, slowing down from 2.15% in the 3rd quarter, according to the real GDP data. Regarding its elements, the personal consumption, the fixed investment, the exports and the imports decelerated respectively. As you see in the chart, the worst element is the exports. It is also notable that the personal consumption did not accelerate despite the radical decline in energy prices. On the 3rd of December, the ECB (European Central Bank) decided to cut interest rates and extend its quantitative easing. The deposit rate was lowered from -0.20% to -0.30%, and it was declared that the central bank would maintain the QE until March of 2017, postponed from September of 2016. As Dr Mario Dragi, the governor of the ECB, had suggested further easing in advance, some investors were expecting the expansion of the QE, which was not decided this time. 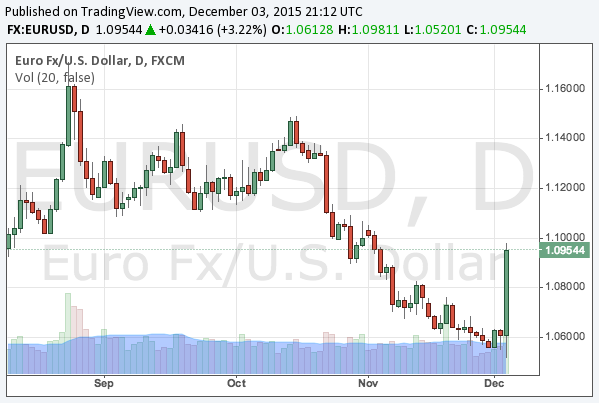 Consequently, EUR/USD sharply rebounded. The Form 13F for the third quarter is now available, so that now we can see the buy positions of famed hedge fund managers. This time, we review those of Mr George Soros and Mr John Paulson. One of the most interesting positions of Soros Fund Management would be his buying call options of iShares China Large-Cap ETF (NYSEARCA:FXI; Google Finance), which invests in large Chinese companies. Mr Soros bought the call options for the stocks of $140 millions, which means he bet on a quick rebound of Chinese stocks. 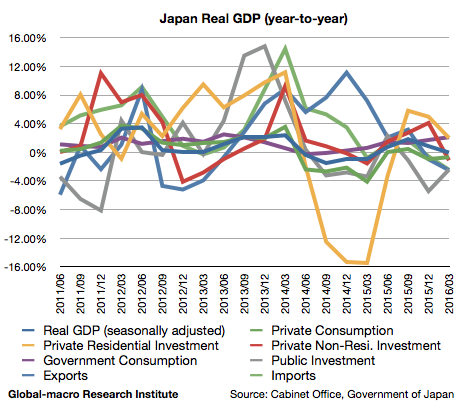 On the 16th of November, the Cabinet Office of Japan published the GDP data for the 3rd quarter of 2015. The real GDP grew 1.08% (year-on-year) during the quarter, revealing that the economy slightly recovered from the negative growth after the consumption tax hike in 2014. To compare, the growth for the previous quarter was 1.00%. We look into the details of the numbers. 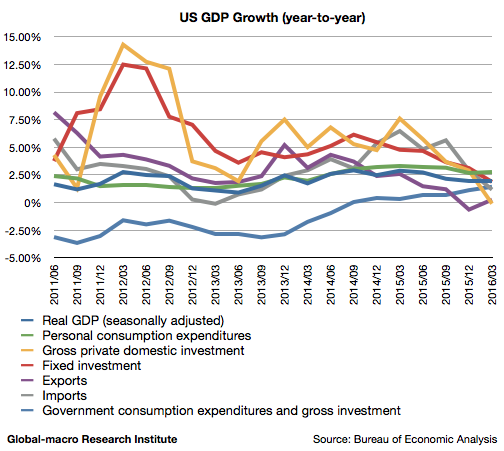 From the graph we observe the investment is the one that slowed down the most. The strong imports are also a minus to the GDP growth, although it might imply the domestic demand is still alive. We look into each factor closely. The FOMC meeting was held on 17th of September, and the Fed decided to leave interest rates unchanged. Investors were speculating the Fed might raise interest rates in this meeting. Richmond Fed President Jeffrey Lacker voted against this decision, insisting the Fed should raise interest rates by 0.25%.